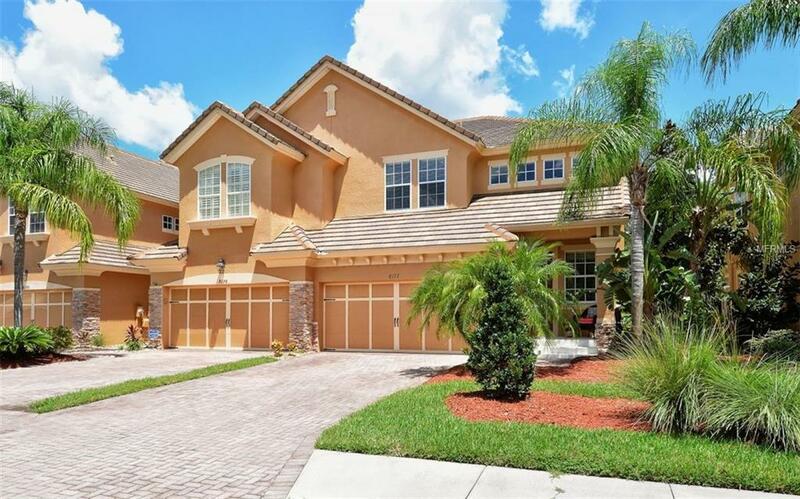 PRICED REDUCTION Gated, maintenance-free community, this beautiful Bella Vista Townhome end unit shows like a model. LOT LOCATION is one of the best locations in all of the Sonoma community, nestled within the deepest lot providing lake views with an 88 acre preserve, covered activity area and walking trails. The open floor plan features 3 bedrooms, 2.5 baths and den. All windows, along with the French door openings are High Impact Hurricane-rated glass, and sliding glass doors have Hurricane Shutters. The kitchen features eat-in bar, breakfast area, 42 cherry wood cabinets, new complete Samsung Stainless Steel appliances, and flooring tiles laid on a diagonal pattern. Beautiful window treatments and abundant crown molding throughout home. The 14x16 roof-covered brick paver screened patio with your sliders open gives you an extension of the greatroom during cooler months enjoying the gorgeous outdoor views of Twin Lakes and preserve. The upper floor features a large Master Suite with tray ceiling and crown molding, walk-in closet, and the master bath is complimented with two sink vanities, shower and large soaking tub. Relax on your screened Veranda off master bedroom. Additional loft area is perfect for an office or media space. The two-car garage has ceiling hanging storage racks, pre-plumbed and electrical stub for water softener system. Your HOA includes all building painting, power washing, along with any roof repair requirements. Sonoma amenities include Swimming Pool, Tennis Court and Tot Lot.